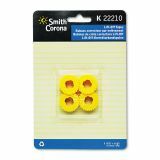 Smith Corona 22210 Lift-Off Tape - K-Series Correcting Tape Spool is designed for use with Wordsmith 100, 150, 200, and 250 typewriters. Tape lifts off errors quickly and cleanly. Use only with correctable film black ribbon cassettes.